Since the state of Iraq was created early this century, the working class in the area have suffered brutal exploitation and repression at the hands of the rival ruling class groups competing for power. As if dealing with these home grown gangsters wasn't enough, they have also faced the bullets and bombs of the global capitalist powers (especially Britain and America) seeking to control the oil wealth of this part of the world. Meanwhile opposition political organisations such as the Iraqi Communist Party and the Kurdish Democratic Party have consistently made deals with both Iraqi regimes and the global powers at the expense of those who they claimed to be leading in resistance to the state. Despite all this, the working class has shown itself a force to be reckoned with, toppling governments and sabotaging war efforts. This brief chronology charts some of the key moments in a century of war and rebellion. Iraq doesn't exist. Since the sixteenth century the area that will later become Iraq has formed part of the Turkish-based Ottoman Empire. The Empire's rule is based in the cities; the countryside remains dominated by rural tribal groups, some of them nomadic. Turkey sides with Germany in the First World War. To protect its strategic interests and potential oil fields, Britain occupies Basra in November 1914, eventually capturing Baghdad in 1917. By the end of the war, most of the provinces of Iraq are occupied by British forces although some areas remain "unpacified". Colonial direct rule is established in "British Mesopotamia", with the top levels of the administration in British hands. Throughout 1919 and 1920 there are constant risings in northern Iraq, with British military officers and officials being killed. The different tribes in this area share a common Kurdish language and culture, but at this stage there is little demand for a separate Kurdish nation state. The issue is rather resistance to any external state authority. The RAF bomb Kurdish areas. Wing-Commander Arthur Harris (later known as "Bomber Harris" for his role in the destruction of Dresden in World War Two) boasts: "The Arab and the Kurd now know what real bombing means in casualties and damage. Within 45 minutes a full-size village can be practically wiped out and a third of its inhabitants killed or injured". Colonel Gerald Leachman, a leading British officer declares that the only way to deal with the tribes is "wholesale slaughter". The RAF Middle Eastern Command request chemical weapons to use "against recalcitrant Arabs as (an) experiment". Winston Churchill, Secretary of State for War comments "I am strongly in favour of using poisonous gas against uncivilised tribes.. It is not necessary only to use the most deadly gases: gases can be used which cause great inconvenience and would spread a lively terror and yet would leave no serious permanent effects of most of those affected". Others argue that the suggested gas would in fact "kill children and sickly persons" and permanently damage eyesight. At this stage, technical problems prevent the use of gas, but later it is deployed. In the post-war carve up of the spoils of conquest between the victorious imperialist powers, Britain gets Iraq (as well as Palestine), France gets Syria and Lebanon. The borders of the new state of Iraq are set by the great powers, setting the scene for a century of border conflicts (e.g the Iran/Iraq war). The British authorities impose tight controls, collecting taxes more rigorously than their predecessors and operating forced labour schemes. In June 1920 an armed revolt against British rule ("the Revolution of 1920") spreads across southern and central Iraq. For three months Britain loses control of large areas of the countryside. British military posts are overrun, and 450 British troops are killed (1500 are injured). By February the rebellion has been crushed, with 9000 rebels killed or wounded by British forces. Whole villages are destroyed by British artillery, and suspected rebels shot without trial. The air power of the RAF plays a major role; what this involves is shown by one report of "an air raid in which men, women and children had been machine gunned as they fled from a village". Britain decides to replace direct colonial rule with an Arab administration which it hopes will serve British interests. At the head of the new state structure, Britain creates a monarchy with Faysal as Iraq's first King. Although senior positions are now filled by Iraqis, ultimate control remains with their British advisers'. Britain's Labour Government sanctions the use of the RAF against the Kurds, dropping bombs and gas, including on Sulliemania in December. The effects are described by Lord Thompson as "appalling" with panic stricken tribespeoplefleeing "into the desert where hundreds more must have perished of thirst". The Anglo-Iraq Treaty paves the way for independence. However the Treaty provides for Britain to maintain two air bases, and for British influence on Iraq's foreign policy until 1957. In negotiations the British government contends that Kuwait "is a small expendable state which could be sacrificed without too much concern if the power struggles of the period demanded it". General strike against the Municipal Fees Law which imposes draconian new taxes (three times heavier than before) and for unemployment compensation. Thousands of workers and artisans, including 3,000 petroleum workers, take part and there are clashes with the police. The RAF flies over urban centres to intimidate strikers and their supporters. The Artisans Association' (a union) organise a month long boycott of the British-owned Baghdad Electric Light and Power Company. After this, unions and workers' organisations are banned and forced underground for the next ten years with their leaders imprisoned. Sporadic tribal rebellions, mainly in the south of the country. Causes include the government's attempt to introduce conscription (the focus of a revolt by the minority Yazidi community), the dispossession of peasants as tribally-owned lands are placed in private hands, and the decreasing power of tribal leaders. The revolts are crushed by air force bombing and summary executions. King Ghazi is killed in a car crash. Many Iraqis believe that there has been a conspiracy, as the King had become outspokenly anti-British. During an angry demonstration in Mosul, the British Consul is killed. British troops land at Basra. The Iraqi government demands that they leave the country. Instead Britain re-invades Iraq and after the thirty days war' restores its supporters to power. During the British occupation, martial law is declared. Arab nationalist leaders are hanged or imprisoned, with up to 1,000 being interned without trial. Despite this, British forces do not intervene when Rashid supporters stage a pogrom in the Jewish area of Baghdad, killing 150 Jews. The Iraqi government negotiates a new treaty with Britain which would have extended Britain's say in military policy until 1973. British troops would be withdrawn from Iraqi soil, but would have the right to return in event of war. On January 16, the day after the Treaty is agreed at Portsmouth, police shoot dead four students on a demonstrations against the treaty. This prompts an uprising that becomes known as al-Wathba (the leap). Militant demonstrations and riots spread across the country, directed not just against the proposed Treaty but against bread shortages and rising prices. Several more people are killed a few days later when police open fire on a mass march of railway workers and slum dwellers. On 27 January 300 to 400 people are killed by the police and military as demonstrators erect barricades of burning cars in the street. The cabinet resigns and the Treaty is repudiated. In May 3,000 workers at IPC's K3 pumping station near Haditha strike for higher wages bringing the station to a halt. After two and a half weeks, the government and IPC cut off supplies of food and water to the strikers, who then decide to march on Baghdad, 250 km away. On what becomes known as the great march' (al-Masira al-Kubra), strikers are fed and sheltered by people in the small towns and villages en route before being arrested at Fallujah, 70 km from Baghdad. Port workers strike for increased wages, more housing and better working conditions. Strikers take over the Basra generator, cutting off water and electricity in the city. Strikers are killed when police move in. In October students go on strike over changes in examination rules. The movement spreads to mass riots in most urban centres, known as al-Intifada (the tremor). In Baghdad a police station and the American Information Office are burned to the ground. A military government takes over, declaring martial law. There is a curfew, mass arrests and the banning of some newspapers. 18 demonstrators are killed in military action. Egypt nationalises the Suez Canal. Britain, Israel and France launch a military attack on Egypt. The government closes all colleges and secondary schools in Baghdad as huge demonstrations, strikes and riots spread. Two rioters are sentenced to death following clashes with the police in the southern town of al-Havy. Martial law is imposed. Popular unrest throughout the country, including in Diwaniyah where in June 43 police and an unknown number of demonstrators are killed in a three hour battle. A month later the "14 July Revolution" brings to an end the old regime. A coup led by members of the Free Officers seizes power, denounces imperialism and proclaims a republic. The royal family are shot. Crowds take to the streets and a number of US businessmen and Jordanian ministers staying at the Baghdad Hotel are killed. People take food from the shops without paying, thinking that money is now obsolete. To prevent the revolution spreading out of their control, the new government imposes a curfew. After a brief power struggle within the new regime, Abd al-Karim Quasim becomes prime minister (as well as commander in chief of the armed forces) and continues to rule with the support of the Iraqi Communist Party (ICP) and other leftists. Without waiting for Quasim to deliver on his promises of land reform, peasants in the south take matters into their own hands. In al-Kut and al-'Amarah they loot landlords' property, burn down their houses, and destroy accounts and land registers. Fearing the spread of rebellion throughout the Middle East, the United States sends 14,000 marines to Lebanon. Plans for a joint US/British invasion of Iraq come to nothing because "nobody could be found in Iraq to collaborate with". In Mosul, Arab nationalist officers stage an unsuccessful coup against the government, prompted largely by anti-communism. Popular resistance goes beyond suppressing the coup: the rich are attacked and their houses looted. There are similar scenes in Kirkuk where 90 generals, capitalists are landlords are killed in violent clashes ( excesses' later denounced by the ICP). Quasim cracks down on radical opposition. 6000 militant workers are sacked. Several Communist Party members are sentenced to death after for their role in the Kirkuk clashes. Despite this the ICP leadership continues to support the government, urged on by Moscow. Quasim's government is overthrown in a January coup which brings to power the Baathists for the first time. The Arab nationalist Baath party favours the joining together of Iraq, Egypt and Syria in one Arab nation. In the same year, the Baath also come to power in Syria, although the Syrian and Iraqi parties subsequently split. The Baath strengthen links with the United States, suspected by many of encouraging the coup. During the coup, demonstrators are mown down by tanks, initiating a period of ruthless persecution during which up to 10,000 people are imprisoned, many of them tortured. The CIA help to supply intelligence on communists and radicals to be rounded up. In addition to the 149 officially executed, up to 5000 are killed in the terror, many buried alive in mass graves. The new government continues the war on the Kurds, bombarding them with tanks, artillery and from the air, and bulldozing villages. After a split in the Communist Party, a group lead by Aziz al-Hajj launches guerrilla warfare against the state, influenced by Che Guevara and Maoism. There are assassinations of individual capitalists and wide-scale armed confrontations. The Iraqi oil industry is nationalised. War breaks out again in Kurdistan as the agreement with the KDP breaks down. The KDP is deprived of its traditional allies in the CP and the Soviet Union, now supporting the Baath. Instead it seeks and receives aid from the USA and the Shah of Iran. The Baathists launch napalm attacks on the Kurdish towns of Halabja and Kalalze. The Iraqi military continues bombing civilian areas in Kurdistan, killing 130 at Qala'Duza, 43 in Halabja and 29 in Galala in April. War breaks out between Iraq and the new Iranian regime lead by Ayatollah Khomeni. The conflict centres on border disputes and the prospect of the Islamic revolution spreading to Iraq. Iran shells the Iraqi cities of Khanaqin and Mandali; Iraq launches a bombing mission over Tehran. Popular anti-government uprising in Kurdish areas. The government decrees that deserters from the army (anyone who has gone absent without leave for more than five days) will be executed. In the southern marsh regions, the Iraqi army launches a massive military operation with the help of heavy artillery, missiles and aircraft to flush out the thousands of deserters and their supporters in the area. Rebels do not only run away from the war, but organise sabotage actions such as blowing up an arsenal near the town of Amara. In the village of Douru armed inhabitants resist the police to prevent house-to-house searches for deserters. At Kasem in the same area armed rebels clash with the military. Villages supporting the rebels are destroyed and their inhabitants massacred. Jalal al-Talabani's Patriotic Union of Kurdistan calls a truce with its troops fighting alongside the Baath. Start of the "War of the Cities" with Iran and Iraq firing missiles at each other's capitals. In May there is an uprising in the Kurdish town of Halabja led by the many deserters from the army living in the town. According to one eye witness "the governmental forces were toppled. The people had taken over and the police and army had to go into hiding, only being able to move around in tanks and armoured divisions". Hundreds of people are killed when the rebellion is crushed. Armed deserters take over the town of Sirwan (near Halabja). The Iraqi air force destroys the town with bombs and rockets. Halabja is bombed by Iran, and then on 13 March the Iraqi government attacks the town with chemical weapons killing at least 5,000 civilians. Poor people attempting to flee the town for Iran before the massacre are stopped from doing so by Kurdish nationalist peshmerga. Throughout this period of insurgency there is widespread suspicion of the Kurdish nationalist parties because of their history of collaboration with the state and their lack of support for working class revolts. The Americans send a naval force to the Gulf after attacks on oil tankers. It effectively takes the Iraqi side, shooting down an Iranian passenger jet killing nearly 300 people, and attacking Iranian oil platforms, killing another 200. In August Iran and Iraq agree a ceasefire bringing to an end the first Gulf War. The British government secretly agrees to relax controls on arms exports to Iraq. In January the US military, with support from Britain and the other 'Coalition Forces' launches Operation Desert Storm, a massive attack on Iraq and its forces in Kuwait. The conflict is less of a war than what John Pilger calls "a one-sided bloodfest". The allied forces suffer only 131 deaths (many of them killed by 'friendly fire'), compared with up to 250,000 Iraqi dead. Despite General Norman Schwarzkopf's public statement that the allies will not attack Iraqis in retreat, Iraqi conscripts are slaughtered even after the unconditional withdrawal from Kuwait has begun. The day before the 'war' comes to an end, troops (and civilians) retreating from Kuwait City on the Basra highway are massacred in what US pilots gleefully call a 'duck shoot'. For miles near the Mutla Ridge, the road is filled with charred bodies and tangled wreckage. An eye witness writes that "In many instances the human form has been reduced to nothing more than a shapeless black lump, the colour of coal, the texture of ash" (Stephen Sackur). In February and March, popular uprisings against the Iraqi government spread across the country. It starts at Basra in southern Iraq, where the spark is rebels using a tank to fire at the huge pictures of Saddam Hussein in the city. Inspired by rebellion in the south, people in Kurdish areas join in. Police stations, army bases and other government buildings are wrecked and torched. Shops are looted. Food warehouses are occupied and the food distributed. In Sulliemania in the north, rebels smash up the prison and set all the prisoners free and then storm the secret police HQ where many have been tortured and killed. Baathist officials and secret police are shot. In some areas, self-organised workers' councils (shoras) are set up to run things. They set up their own radio stations, medical posts (to collect blood donations for the hospital), and militia to resist government forces. In Baghdad itself, there are mass desertions from the main barracks during the war, with officers who try to stop them being shot. Two areas of the city, Al Sourah and Al Sho'ela fall into the effective control of deserters and their supporters. The Western media present the uprisings as the work of Kurdish nationalists in the north and Shiite Muslims in the south, but they are in fact mass revolts of the poor. In fact the main Kurdish nationalist parties (the KDP and the PUK) oppose radical aspects of the uprisings and try to destroy the shora movement. 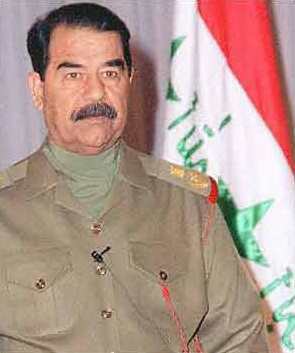 True to form they announce a new negotiated agreement with Saddam Hussein soon after the uprisings are crushed. Although military action ceases, the war on people in Iraq is continued through other means - sanctions. The destruction of water pumping stations and sewage filtration plants by allied bombing is compounded by sanctions which prevent them being repaired. This amounts to germ warfare, as the inevitable consequences are epidemics of dysentery, typhoid and cholera. In 1997, the UN estimates that 1.2 million people, including 750,000 children below the age of five, have died because of the scarcity of food and medicine. The US launches 27 cruise missiles against Iraq. On October 1, Iraqi authorities under the command of Gen. Sabah Farhan al-Duri execute 119 Iraqis and three Egyptians in Abu Ghraib prison near Baghdad. Twenty-nine of those killed are members of the armed forces, and fifty had been imprisoned for their participation in the March 1991 uprisings that followed the Gulf War. This mass execution is apparently a continuation of the "prison-cleansing" campaign launched by the government a year earlier which saw an estimated 2500 prisoners executed. In December, following the expulsion of Weapons Inspectors from Iraq (and during the middle of President Clinton's impeachment crisis) the US launches Operation Desert Fox. Over a four day period, 400 cruise missiles are launched on Iraq, along with 600 air attack sorties. British aircraft also take part in airstrikes. According to Iraq, thousands are killed and wounded in these attacks. In March Grand Ayatollah Mohammed Sadiq-al Sadr, the most senior Shi'ite religious leader in Iraq, is killed, with the suspicion falling on government agents. A major uprising in Basra is suppressed with hundreds of deaths, many killed in mass executions. Western military attacks continue, ostensibly against Iraqi air defenses. On April 11, two people are killed when Western warplanes bomb targets in Quadissiya province. On 27 April, four people are killed by US planes near Mosulin in the northern no-fly zone. On May 9, four people are killed in Basra province, including three in a farmer's house in Qurna. On May 12, 12 people are killed in the northern city of Mosul. Revolutionary defeatism in Iraq, Communism - Internationalist Communist Group, April 1992.